Normally the septum is activated from left to right, producing small Q waves in the lateral leads. In LBBB, the normal direction of septal depolarisation is reversed (becomes right to left), as the impulse spreads first to the RV via the right bundle branch and then to the LV via the septum. This sequence of activation extends the QRS duration to > 120 ms and eliminates the normal septal Q waves in the lateral leads. 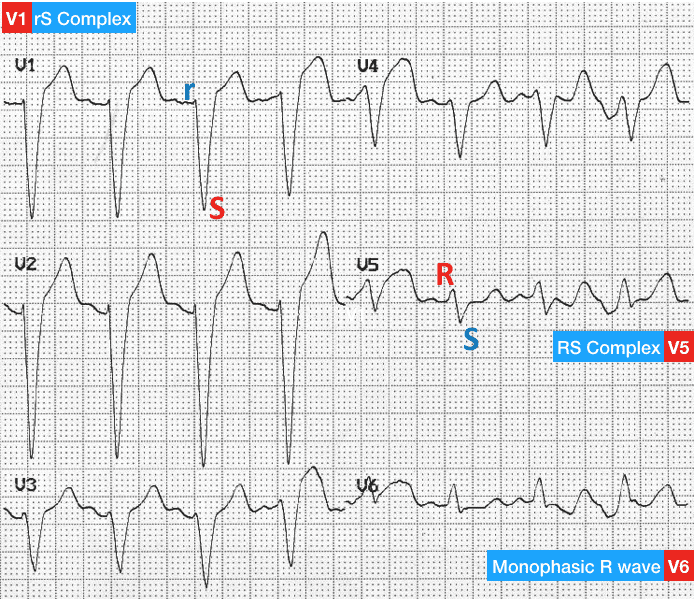 The overall direction of depolarisation (from right to left) produces tall R waves in the lateral leads (I, V5-6) and deep S waves in the right precordial leads (V1-3), and usually leads to left axis deviation. 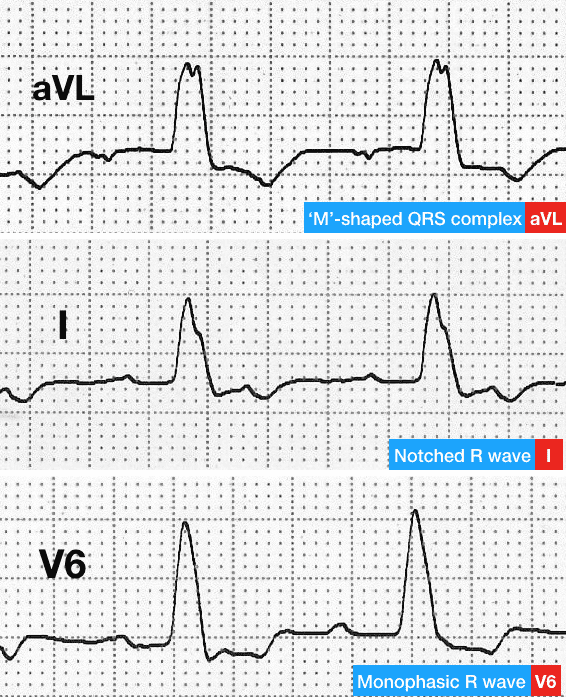 As the ventricles are activated sequentially (right, then left) rather than simultaneously, this produces a broad or notched (‘M’-shaped) R wave in the lateral leads. NB. 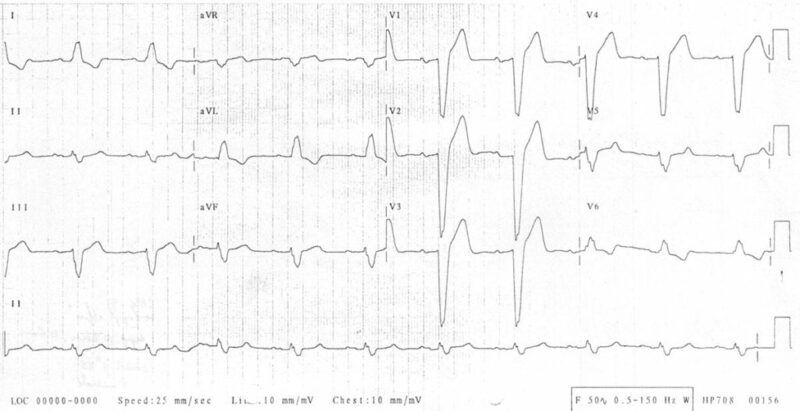 It is unusual for left bundle branch block to exist in the absence of organic disease. 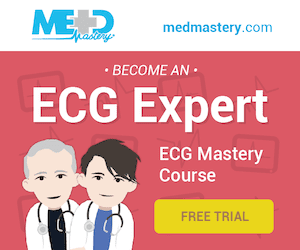 New LBBB in the context of chest pain is traditionally considered part of the criteria for thrombolysis. 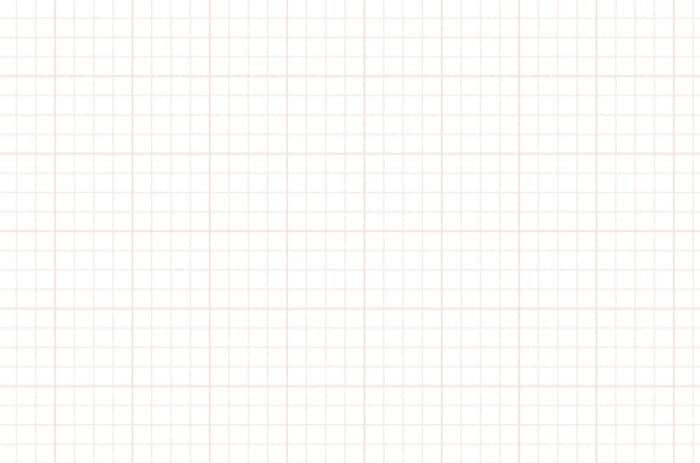 However, more recent data suggests that chest pain patients with new LBBB have little increased risk of acute myocardial infarction at the time of presentation. Incomplete LBBB is diagnosed when typical LBBB morphology is associated with a QRS duration < 120ms. 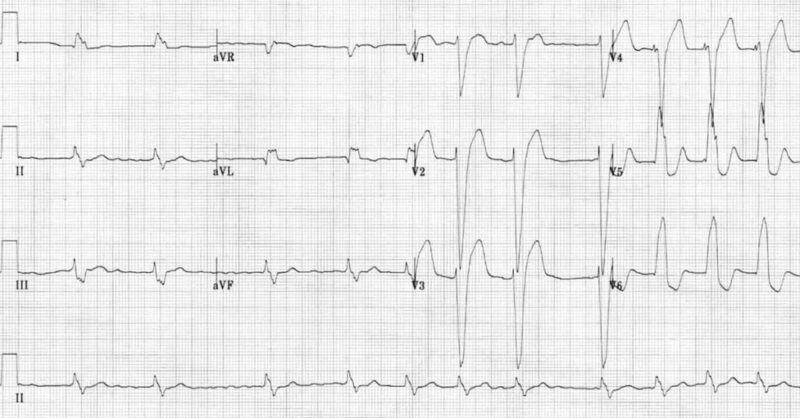 Left ventricular hypertrophy may produce a similar appearance to LBBB, with QRS widening and ST depression / T-wave inversion in the lateral leads. Da Costa D, Brady WJ, Edhouse J. Bradycardias and atrioventricular conduction block. BMJ. 2002 Mar 2;324(7336):535-8. PMID: 11872557.